I'm trying to apply raymarching on top of 3D rasterization, ordering what 3D object gets displayed based on the depth of a rasterization pass and the raymarch depth. After getting the transform right for position (using the information here) I was able to have the position of the raymarched spheres coherent with the rasterized cubes. I ran into issues however with depth being different at the edges of the screen compared to the middle, despite position never changing. The u_depth_texture is where the depth comes from (and what DepthColor corresponds to) The u_screen_texture is just a texture of the rasterization pass information (output of FragColor). float cosA = ray_dir.z; // a.z/length(a), already normalized so length(a) == 1.0. Above I basically added cosA as a seperate value onto the ray, as suggested by the linked answer, with the appropriate code changes to avoid re-running calculateFragmentRay. However I needed to figure out which cosine corresponded to the one in thier picture, I knew it was a lateral dimension, it happened to be Z in this case, and I used the standard method of retrieving cosine from a normalized vector. And here are the results! No depth artifacts! The problem, I think, is that you are comparing two different kinds of depth values. 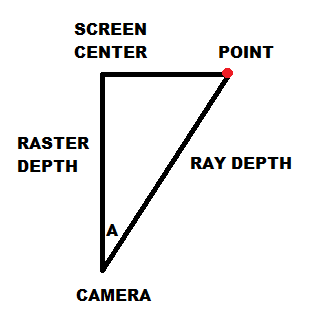 For want of better terms, the rasterizer's depth buffer stores 'parallel' depth, whereas raymarching calculates 'true' depth - that is, the rasterizer stores the distance to the plane parallel to the view plane which contains the point, but the raymarcher calculates the actual 3D distance from camera to point. So try this - in your getRayDirection function, before you do your view rotation, save your fragment ray's original normalized Z value somewhere, maybe an extra field in your Ray struct. Let's call it cosA. Not the answer you're looking for? Browse other questions tagged opengl rendering glsl rasterizer raymarching or ask your own question. Double rasterization work on triangles edges. How to compute normal of surface from implicit equation for ray-marching?